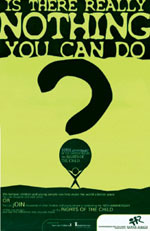 Is there really nothing you can do? To make children think about their rights and responsibilities. To focus on the belief that children can contribute towards the betterment of their communities. To provide a tangible opportunity to raise funds for a hospital, thereby practically demonstrating how children can contribute. To introduce children to the concept of petitions as a tool for making their views heard.